In our previous informed surfer posts, we’ve discussed some basics on how to choose your spot and what to bring but what about when to hit the beach? We want to hit it when the best waves are rolling in! The way we determine this is by reading the forecast. When a surfer asks what the forecast is they are not typically asking for the standard “Sunny and 85 today” response. We are looking for as many factors as possible to determine when there will most likely be rideable waves. Although sunny and 85 is nice, it isn’t necessarily indicative of good waves. Some of the determining factors we look at are swell direction, wave height, swell period, and wind. But what are these and why do they matter? Swell direction tells you from which direction a swell is originating. 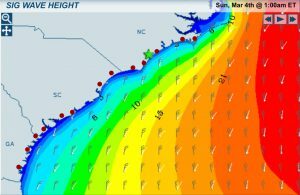 A west swell is coming from the west, a southwest swell coming from the southwest. Easy enough. This is important because not all beaches face the same direction. Depending on the swell orientation to the coast, different surf breaks work better with different swell directions. Swell period is the amount of time it takes a wave to pass a certain point. Simply put, it’s the time between two waves. The longer the swell period, the more time a wave has to form and groom and the more powerful waves will be. This results in that classic beautiful wave. To an extent, a long swell period (8 to 12 seconds here) is just as important as wave height for good surfing. For example, the report may say 2ft at 12 seconds. Even though the wave height is only 2ft, it has a 12 second period, meaning a more groomed powerful wave, great for surfing. Now, imagine you are standing on the beach facing the ocean with a strong breeze in your face. In other words, the wind is blowing onto the shore…onshore wind. An onshore wind takes an organized, clean swell and turns it into choppy surf that is bumpy and more difficult to ride. Offshore winds, winds that blow off the shore and into the coming waves, groom waves by lightly holding them up before they break. The only wind better than offshore wind, when swell is in the water, is no wind at all. Wave dynamics and weather forecasting are pretty in-depth subjects. These are just a couple factors to help you find the best waves. The more you know about how they interact, the better you can predict your epic surfing weekend. 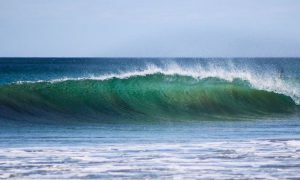 Being able to effectively use these factors when reading a surf report can be the difference between scoring the waves of your life or getting skunked. There are websites and apps that can give you location specific information to help you plan your weekend surf trip. Here are some of the resources that we use: Surfline, Swellinfo, and Magicseaweed. There are also websites we use for day to day conditions that have beach cameras. These give you a real time look at whats going on in the water. It is always a good idea to check the cams before heading out just to confirm the forecast. 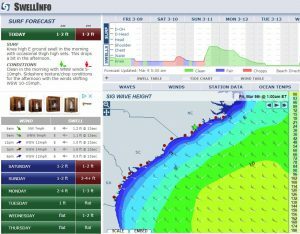 For Wrightsville Beach, we use WB Live Surf.